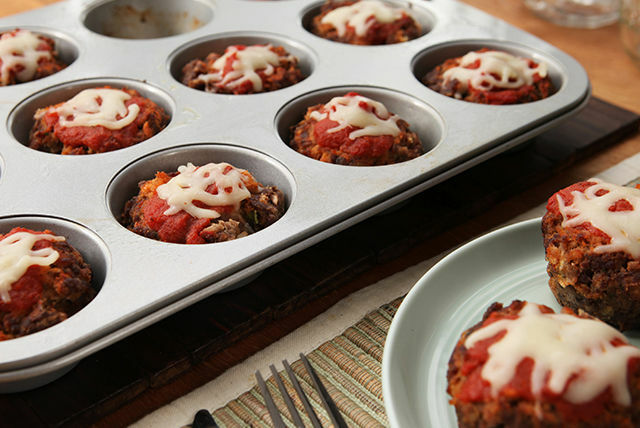 There's only one thing as exciting as our Italian-style meatloaf: two of these adorable mini muffin-pan versions. (So, OK, make that two things.) These mini meatloaves are sure to be a family fave. Mix first 4 ingredients until blended. Press into 12 muffin cups sprayed with cooking spray. Use back of spoon to make indentation in centre of each; fill with pasta sauce. Bake 30 min. or until meatloaves are done (160ºF). Top with cheese; bake 5 min. or until melted. Remove baked meatloaves from muffin cups; cool, then freeze in single layer on baking sheet until firm. Transfer to airtight container; freeze up to 4 weeks. When ready to serve, thaw desired number of meatloaves in refrigerator overnight, then microwave until heated through. Or, place frozen meatloaves on baking sheet and bake in 375°F oven 20 min. or just until warmed.